Remember that shrimp I made awhile ago - Aarti's Friday Shrimp? Well, that was my inspiration for this dish. Slightly different ingredients but basically the same delicious, garlicky taste. This recipe is big on flavor with quite a bit of turmeric and garlic, both of which I enjoy in large quantities. However, feel free to cut back a smidge, if this feels like too much for you. In medium to large bowl mix garlic, parsley, turmeric, olive oil, and salt. Next add scallops and toss to coat. Be sure to use tongs or gloved hands, to avoid turning your fingers yellow from the turmeric. Heat skillet to medium-high heat and add coconut oil. When oil is hot add scallops. 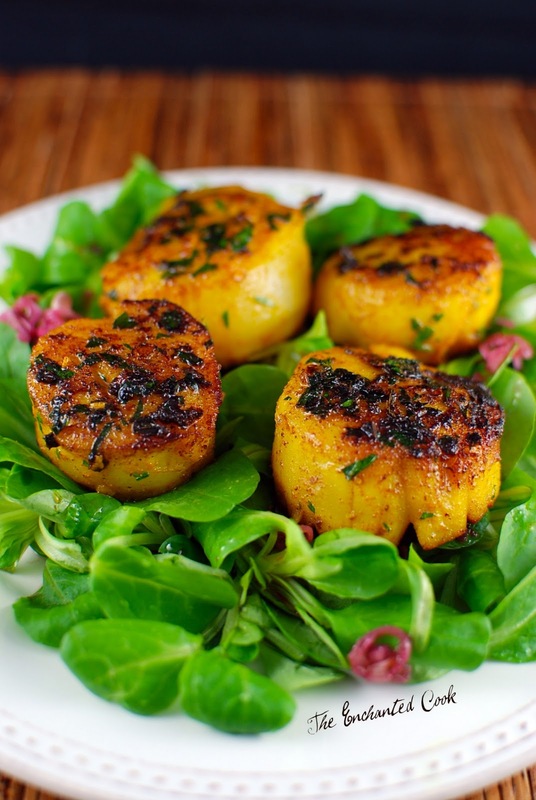 Cook approximately 1-2 minutes per side or until scallops are opaque and feel slightly firm to the touch. Be careful not to overcook as it will result in the scallops being tough. Serve over a salad of mixed greens with a light vinaigrette - in this case I used mache greens with a blood orange and citrus champagne vinaigrette (juice from blood oranges, citrus champagne vinegar, thinly sliced green onion-whites only, minced garlic, EVOO, kosher salt). Wendy - Thanks! I totally understand the not eating scallops - mine won't either, no matter how amazing they are! Lol Kristie - here either, clearly!! Veronica - these look wonderful I love scallops, and they are in season here right now (we have a restricted season in New Zealand for catching them). They are however pretty expensive here, but since my partner is not that fussed on them I feel I can justify the occasional special treat for myself - I definitely going to try these. What an interesting preparation of scallops. I might list them as my favorite seafood,so I'm always looking for new ways to cook them. This really looks fabulous! i seriously need photo lessons from you- the scallops look gorgeous! Wow those look good. I love the color, I've never had tumeric on scallops but I bet it was good. Wow...these look incredible! That photo looks good enough to eat! I love the flavors in this dish...anything garlicky is a winner in my book. Sue - How perfect that they are in season there! I love scallops any way you can fix them and this was a nice change of pace. 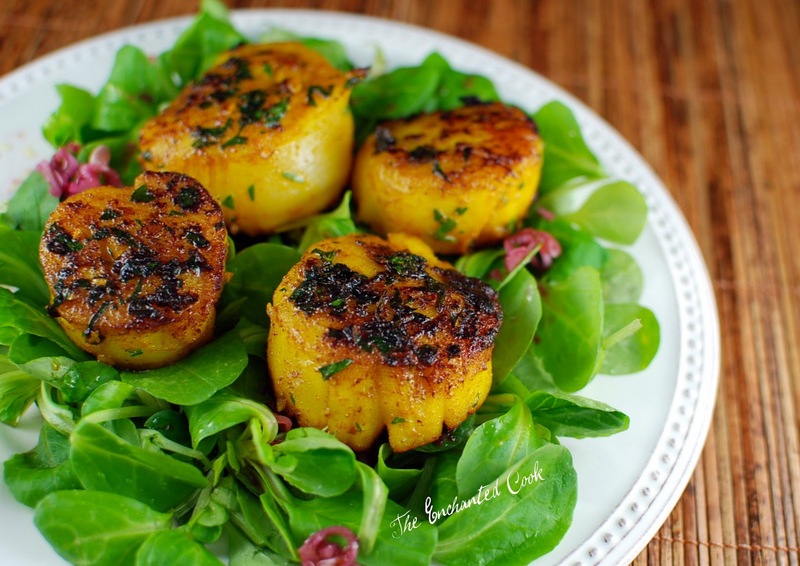 Carrie - Scallops are definitely one of my favorites, too! Clarie - you are too kind - thank you! Gina - I turmeric as much for the color it gives as anything else (flavor, health benefits)! Enchanted-I am in awe of your gorgeous pictures-- everything looks amazing and i can almost smell the dishes as i drool over my computer keypad. you must tell me the secret :) we must be on the same food wavelength (or shopping at the socal farmers markets) because for the past few weeks, we have made very similar dishes. I made stuffed peppers, chicken marsala, scallops, grass fed ribeye...love your recipes too. I wish my husband liked scallops because these look phenomenal. I will have to wait until he's away and cook these just for me! Hey Edamame - Sounds like we are! Looks like I'm going to need to head back over to The Year of Eating Consciously at http://edamame2003.blogspot.com for another visit! Carolyn - We are in the same boat! My husby is out of town right now and look at me cooking scallops and all - lol! Jay - I hope you found something yummy at the fish market! What a shame you can't get scallops where you are, but then again you have all that fabulous scenery and other great foods! You cease to amaze me. Turmeric and scallops?! Yes -- I will be trying this sometime. Lol CSE! I hope you try them and let me know what you think! Holy shikeys. i tried this and it was the best scallop i have e v e r eaten. thank you for sharing. Uhmazing. i have a new use for the many uses i already have for turmeric.